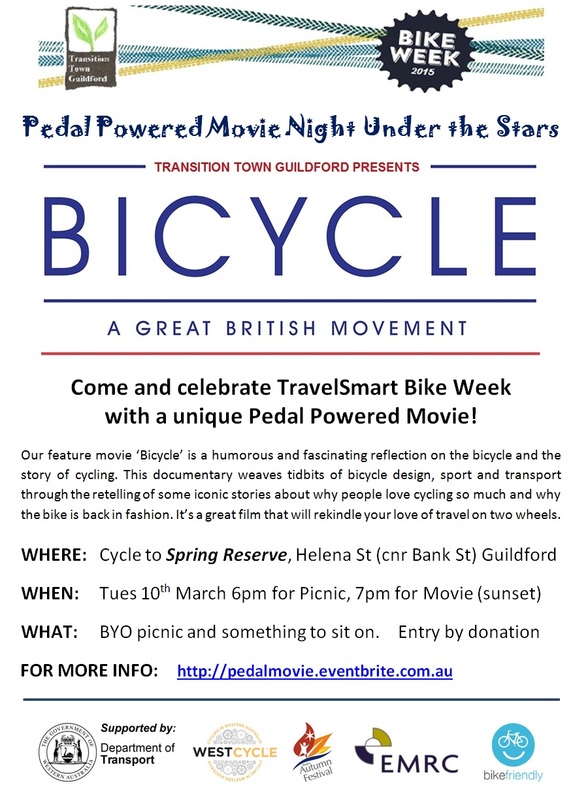 To coincide with Bike Week, we’ve got a special movie night for March – Transition Town Guildford hosts a pedal powered movie under the starry Guildford sky. This free community film night will be powered by the energy of volunteer riders pedalling stationary bikes. Anyone is welcome to pedal. There are bikes of all styles and sizes for men, women and kids. So pack a picnic, ride in and get ready to pedal for a memorable movie night under the stars. Join us for an outdoor movie powered by you! Please cycle down, there will be bike racks. Bring a blanket and picnic and enjoy the evening from 6 pm. Movie starts after dark ~7 pm. Don’t forget jumpers. We’ll have mozzie repellent. This entry was posted in Community, Event, Movies, Transport and tagged Bike week, Cycling, Documentary, Pedal-powered movie, Spring Reserve Guildford, stationary bikes, West Cycle. Bookmark the permalink.